Software-defined networking (SDN) gained early traction in companies like cloud providers with the resources to launch it and a need for its benefits. Quick to use SDN to make networks programmable, scalable and more flexible, they were up for taking the risk that comes with acquiring the latest technology for network architecture. Soon, enterprises began to use SDN. But that trickle has yet to turn into a flow: The technology is still in its early stages, in terms of adoption. But few deny SDN is in the future, and so it is a matter of time before enterprises use SDN in their data centers. 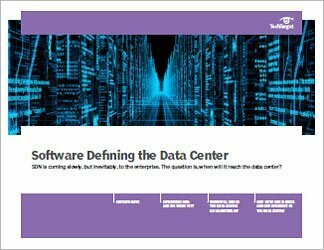 This three-part guide focuses on SDN use in the data center. It opens with an overview chapter on SDN practices in the enterprise and what roadblocks still remain to widespread adoption. The two subsequent chapters then look specifically at SDN in the data center. First, we examine whether it's time for SDN to become a mainstream approach to the data center; finally, we consider the roles of network fabrics and SDN and where they overlap in the data center. 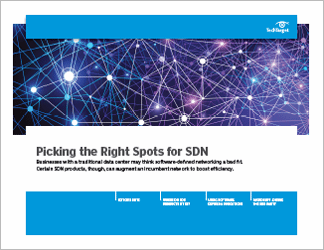 Readers of this guide to SDN use in the data center will come away with a deeper understanding of SDN advantages and drawbacks and how these could play out in a modern data center. Enterprise SDN: Are we there yet? When will SDN in the data center go mainstream?